The white side will grip any textile floor covering (fitted carpet). GILTGRIP adheres firmly to your rug and carpet and so helps to prevent slipping or falling over. Place the underlay white side down facing the carpet; then place the rug on top of the gray side. The gray side is ideal for use on hard flooring surfaces such as marble, hardwood, ceramic, vinyl or stone. GILTGRIP adheres firmly to your rug and floor. Place the underlay gray side down; then place the rug on top of the white side. Above is a pic of a most fascinating experience: the Wool Market in Kars, Eastern Turkey. Being a sheep-farmer's daughter, I was captivated by it all. Since wool is the primary ingredient of hand-made rugs, I thought it proper to start at the start! 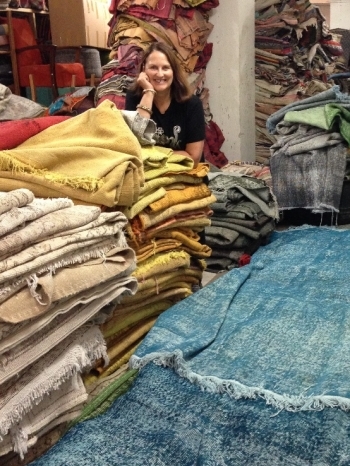 Only natural fibers are used to make handmade rugs. Wool is soft, durable, easy to work with, relatively cheap and dyes well. This combination of chacacteristics is not found in other natural fibres. As well as wool, silk and cotton are sometimes used and goat and camel hair are used by nomadic weavers where extra strength is needed, such as lashing together the seams of bags. Cotton is sometimes used for the warp or foundation threads, and white cotton provides contrast in weaving (wool turns ivory with age). Silk is used for very fine weaving. The fat-tailed sheep of Turkey lives in the high mountainous areas and is famous for its coarse, long staple that makes especially stong wool, gives a lustrous shine and dyes easily. All necessary to weave a beautiful rug. New Zealand wool is also commonly used. It is highly sought after, readily available and has a consistent texture. You never know....when you leave Turkey with a newly-purchased rug in you suitcase, it is more than likely you are leaving with a small piece of New Zealand!